= Nanka hana ni tsuiteruyo! = You have something on your nose! = Maggie sensei no atama nimo nanika tsuite imasuyo. = You have something on your head, too, Maggie Sensei. = Get rid of it! There are so many meanings and idioms using つく( = tsuku) but I will focus on a few major usages in this lesson. See the pictures? There is something on the bear’s nose. In casual conversation, we sometimes drop い ( = i) so instead of the standard 「ついている」 you’ll see 「ついてる」. It is considered grammatically wrong but people say that all the time so I will use it in this lesson. = Doresu ni kuriiningu no tagu ga tsuiteiru no wo shirazu ni ichinichi sugoshita. = I spent the whole day — never noticing that I had a dry cleaner’s tag on my dress. =Hoppeta ni gohantsubu ga tsuiteruyo. = You have a grain of rice on your cheek. = Kutsu no soko ni gamu ga tsuita. = Gum stuck to the bottom of my shoes. = Kustu no soko ni gamu ga kuttsuita. = Kooto ni shimi ga tsuite imasu yo. = You got a stain on your coat. = Te ni penki ga tsuita. = I got some paint on my hand. ＝Kono kuruma niwa nabi ga tsuite iru. = This car has a navigation system. = Kono kuruma niwa nabi ga aru. = There is/isn’t a navigation system in this car. The translation is the same but ある means ” to have ~ , there is / are ~ “. We use them when we talk about the existence or possession of something. = Kono hoteru no heya niwa terebi ga tsuite inai. = This hotel room doesn’t come with a TV. = Uchi ni wa terebi ga nai. = We don’t have a TV in my house. / There isn’t a TV in my house. When you just talk about if you have a TV or not in your house. = Uchi ni wa terebi ga tsuite inai. = My house doesn’t come with a TV. 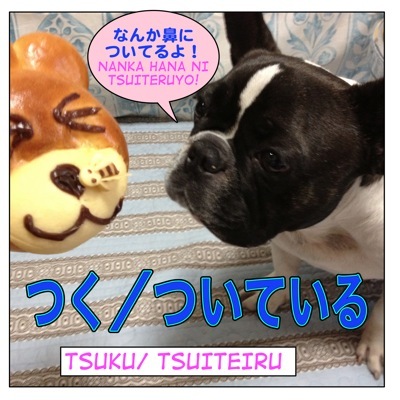 It sounds funny because ついている ( = tsuiteiru) means “to come with” and often used for an additional service. = Watashi no keitai (denwa) niwa kamera ga tsuite inai. = Atarashii moderu niwa takusan no kinou ga tuite imasu. = A new model has a lot of features. = Sono heya niwa ofuro ga tsuite imasuka? = Does that room have a bathroom? = Dono seihin nimo baakoodo ga tsuite imasu. = Kono menuu niwa dorinku ga tuite imasuka? = Does this dish come with a drink? 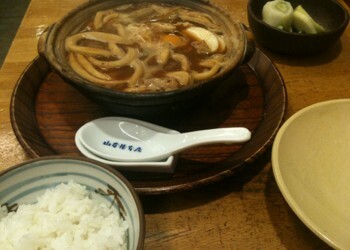 = Misonikomi udon niwa gohan ga tsuite imasu. = This miso noodle come with rice. = Kono zasshi niwa keshou pouchi ga tsuite imasu. = This magazine comes with a makeup bag (as a gift). = Ima, kono zasshi wo kau to keshou pouchi ga tsuite kimasu. = (Literally) If you buy this magazine, it comes with a makeup bag. = If you buy this magazine now, you can get a makeup bag as a gift. = Kono DVD pureiyaa niwa hoshou ga tsuite inai. = This DVD players didn’t come with a guarantee. = This DVD doesn’t have a guarantee. = Choushoku wa tsuite imasu ka? = Does it come with breakfast? / Is breakfast included? = Minna niwa Maggie sensei ga tsuite imasu. = Maggie Sensei has all of your backs. = Haha ga zutto tsuite kanbyou wo shite kureta. = My mother was taking care of me the whole time. = Kyou wa nandaka tsuiteiru. = I am somehow lucky today. = Hoteru no heya, appugureido shite moracchatta! Tsuiterunaa. = I got my hotel room upgraded. I am so lucky. = Minna niwa watashi ga sensei to shite tsuite imasu kara ne.Dakara zettai ni nihongo, jouzu ni narimasuyo. = You have me as a teacher so I can guarantee that your Japanese will improve for sure! I wondered, how would I adress someone else’s dog? Or any pet or animal?With 君? Thank you for your priceless side. You can call someone else’s pet without さん、ちゃん、君 but many people use ちゃん. 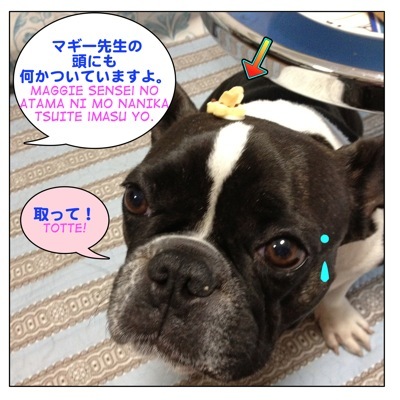 (And some use 君 for male dogs. Thanks to this site that im learning japanese much easier than before. thank you so much sensei! As for this lesson. just want to ask something about this no. 2 meaning of tsuite which it also means to accompany, to come with something extra, to be attached, right? Where is the tsuite action in this example? gomen ne… im kinda slow on this! hehehe thank you in advance. My mother was being with me the whole time and took care of me. Thank you for another great lesson, Maggie! Question: is there a difference between なんか and なにか? Or can they both be used interchangeably to mean “something”? They mean the same. なんか is a casual form of なにか. = Nanika hoshii mono wa arimasu ka? = Is there anything you want? = Nanka hoshii mono aru? I understand now. Your explanation is so good. 2. “母がずっとついて看病をしてくれた。” The verb”看病をする” is to take care of a patient. So is the daughter/son sick or something? A. Is it possible to just say “ついている”? B. Is it right to say “ついてる～” instead? A stretched last letter in this case is ok? I’m confused. When exactly do you use stretched last letter? All verbs apply? or Some of them only? 1. OK,but let’s compare the following two sentences. They both “comes with ~ ” and they are interchangeable. Imagewise, ついている is to describe a set menu with a drink, and ついてくる is used when they serve main thing first and then they will serve/give you a drink later. 2. Since it is used くれた so the speaker gets the action from his/her mother. →My mother took care of me. B: Yes. We tend to stretch some letter not just the last letter but the middle letter.